The Who, the British band who played the 2010 Super Bowl half time show, have made their music available to purchase, download and play in the Rock Band music video game. “The Who Super Bowl S-mashup”, a specially recorded performance, is available to download now at www.rockband.com/music, on Microsoft’s Xbox 360®, Nintendo’s Wii console, and soon to come on PlayStation®3. “The Who” launched their career in 1964 with vocalist Roger Daltrey, guitarist Pete Townshend, bassist John Entwistle, and drummer Keith Moon. Moon died in 1978 of a drug overdose. Entwistle died in 2002. The two remaining band members Daltrey (65) and Townshend (64) perform with supporting musicians to perform hits such as “My Generation”, “Pinball Wizard”, “Who Are You?”, “Won’t Get Fooled Again” and “Baba O’Riley” (the last three which feature as theme songs for CSI shows). 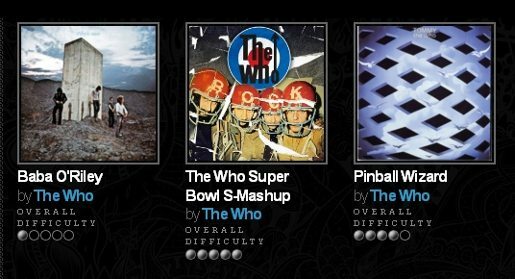 “The Who Super Bowl S-mashup” joins 15 previously released tracks available in the Rock Band music library, from the Rock and Roll Hall of Fame inductees. Those songs include “Won’t Get Fooled Again” featured on the original Rock Band disc and “Pinball Wizard” featured on the Rock Band 2 disc, as well as “Amazing Journey,” “Baba O’Riley,” “Behind Blue Eyes,” “Eminence Front,” “Going Mobile,” “Leaving Here,” “Magic Bus,” “My Generation,” “Real Good Looking Boy,” “Sea and Sand,” “Summertime Blues,” “Who Are You” and “Young Man Blues,” all released as downloadable content in the Rock Band Music Store.